Skyline Turbine Services (STS) specialises in the service of the SGT100 (Typhoon), SGT200 (Tornado), SGT300 (Tempest) and SGT400 (Cyclone) gas turbines, their package components and control systems. The Siemens SGT100 to SGT 400 are some of the most advanced industrial turbines. 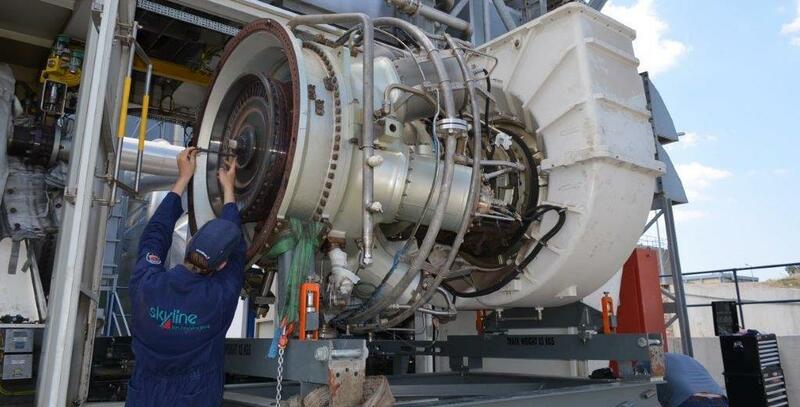 These turbines require specialist maintenance to discover developing damage in the early stages. Our engineers have many years of experience with these turbines and have honed their skills while working exclusively on the turbine range we support. Gas turbines demand a safe and accurate control system, which must be capable of very rapid scan times and include critical compressor surge monitoring to prevent turbine damage. STS Engineers have detailed knowledge of the Rustronic Mark I, Mark II, Allen Bradley and Siemens (PC) S7 control systems. We have access to skilled controls engineers who helped develop the early Rustronic Mark I controls systems, up to Siemens-trained Siemens S7 specialists. For the Rustronic Mark II control system, no longer supported by Siemens, we have more than 100 replacement controls cards in stock and have the capability to test and repair non-functional cards, provided they are not beyond repair. We have a specialist Rustronic card repair facility. When we perform maintenance on your gas turbine, we can provide any part supplied by the OEM. STS owns several gas turbines to support customers with an exchange or lease core, and is able to supply refurbished ‘zero’ hour service exchange hot section parts to reduce customers’ shutdown times. In addition to this, we have a considerable collection of spare parts for the SGT 100 and SGT 200 packages, as well as special tooling to assist with the dismantling for above engines. We also own SGT 400 Gas Generator strip down tooling, which we had made during the overhaul of an SGT 400 in 2015. Our support encompasses the normal A-type service up to the full overhaul, C-service, of your turbine. Full overhauls are performed at our facility in Poeldijk, the Netherlands. STS provides full operation and maintenance solutions, developed with extensive product knowledge, customer-oriented service and with alliance partners. These solutions allow STS to provide a broad range of maintenance services under a flexible and performance-based contract structure. Our aim is to extend the lifespan of your critical parts, increase engine reliability and availability whilst reducing costs. We achieve this through repairs of hot section components such as combustion liners, transition pieces, rotor blade inspections, repairs and re-coating, stator vane inspections repairs and re-coating. STS enables SGT 100 through to SGT 400 users and owners to clearly define the scope of services they require, rather than using a prescriptive approach typical of equipment manufacturers. Our aim is to support our customers and their equipment whenever required. We are ISO 9001-2008 and SCC* or VCA* (safety) accredited. Skyline Turbine Services is exhibiting at the PowerGen conference programme in Cologne, Germany, from 27-29 June. A white paper demonstrating an SGT 400 gas generator being dismantled and rebuilt. Pen y Cymoedd is an onshore windfarm built in the county boroughs of Neath Port Talbot and Rhondda Cynon Taf, South Wales, UK.